We invite you to explore India - the Land with infinite beauty ! Whether you soar high into Himalayas or peer under the ruins of the Ancient monuments dotting the landscape of India, you will cherish the experience long after your visit ! This India Travel Guide on Tomb of Sher Shah Suri is free from any commercial interest! This site is dedicated to promote India - the vast subcontinent, its glorious past, magnificent landscape and its infinite variety. 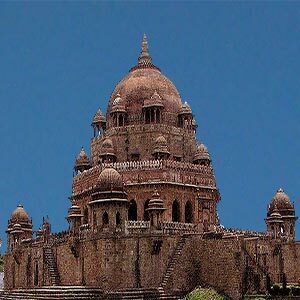 The tomb of Sher Shah Suri built in red sandstone stands tall and elegant in Sasaram in Bihar; just off the Grand Trunk Road. Emperor Sher Shah Suri founded the Suri dynasty that encompassed a large portion of northern India. He was credited with building of the Grand Trunk Road from Kolkata to Peshawar. He also built roads connecting Agra to the Gujarat seaports to enhance trade and commerce. His rule saw the introduction of a postal service as well as the rupaiya as a currency. The Purana Quila near Delhi on the banks of the Yamuna is one of the architectural wonders built during the time of Sher Shah Suri. He began the construction of his own tomb at Sasaram in Rohtas district of Bihar. But the construction was completed by his son due to the sudden demise of Sher Shah Suri. The tomb mirrors Afghan architecture in India and is a blend of Indo-Islamic architecture. The tomb stands right in the middle of a square tank (an artificial lake) and is a magnificent structure partly finished with stone. The exterior of the tomb was originally glazed and painted with a color combination of red, white, blues and gold. Traces of colors can be seen until date on the parapets and ramparts. The tomb rises to a height of about 305 meters above a large stone terrace. A parapet wall encloses the terrace and the four corners have octagonal domed pavilions. This Tomb is also referred to as the second Taj Mahal of India. The 3-storied mausoleum is located on a low octagonal pedestal right at the middle of the terrace. The mausoleum was originally planned to be a typical island tomb with no access to the mainland. The height of the tomb measures 37.57 meters from the terrace. A tall wall surrounding the tomb encloses the upper terrace. There are four octagonal domed chambers at four corners of this huge tomb. There is a grand doorway which is the only entrance to the tomb. A beautiful walkway links the tomb with the guardroom. The verandah is covered by 24 small domes and each of these domes is supported on arches. Each corner of the verandah supports a cupola. The main mausoleum building has large octagonal chamber surrounded by a wide verandah on all of its sides. The chamber that houses the main tomb is supported by beautiful arches. It is one among the largest domes of India. Large windows on the top portion of the wall provide sufficient light and ventilation to the interiors of the tomb. An inscription in the tomb gives details on the completion date of the tomb. Much of the decorations done within the tomb have vanished over the years. Within the tomb chamber there are 25 graves. The grave of Sher Shah is surrounded by 24 of his nationals. Close to Sher Shah's tomb lies the tomb of his son Aslam Shah. The tomb is grand however incomplete. Close to this location also lies Alawal Khan's tomb, the man who supervised the constructions of the tombs. Sasaram can be reached by rail and road. Accommodation is also available in this small town. This site is one of the tourist attractions of Bihar. It has been shortlisted on the UNESCO World Heritage Site list. Considerable refurbishment was done to protect and preserve this monument. No construction is allowed within a radius of about 100 mts around this site. But there is considerable neglect and lack of upkeep in this historic monument.